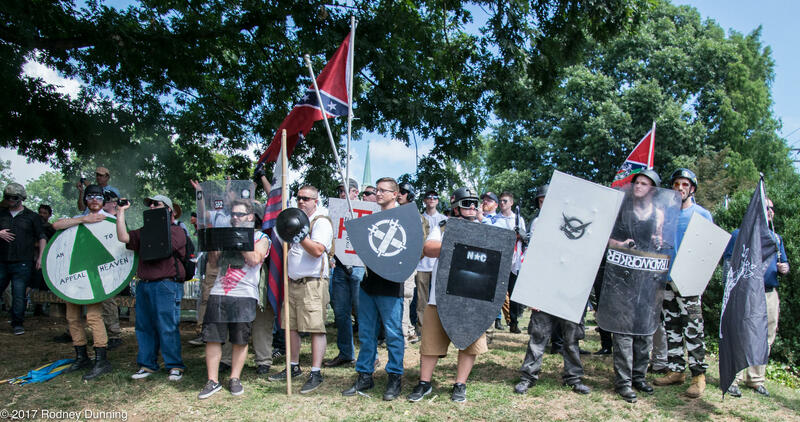 Members of white nationalist and neo-confederate groups, including The League of the South and the KKK, gathered in Charlotesville, Virginia on August 11-12. Violence at the rally resulted in multiple injuries and one death. When members of white nationalist groups declared that they planned to rally in Shelbyville and Murfreesboro at the end of the month, some asked how the cities could allow such a thing. After all, just two months prior, a similar demonstration in Charlottesville, Virginia resulted in violence, arrests and the death of a woman after a man drove his vehicle into a crowd of counter-protesters. 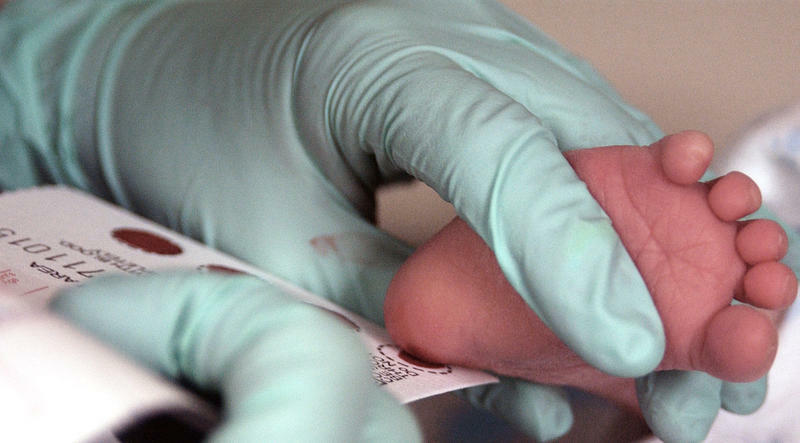 But this is an issue that states and civil rights organizations have had to wrestle with in the past. In August, it was the American Civil Liberties Union, a nonprofit tasked with defending the first amendment, that helped the group of white supremacists in Charlottesville after their permit to rally at Emancipation Park was originally denied. The ACLU's Tennessee chapter did something similar in 1990. The organization represented the KKK after they were denied a permit to hold a parade in Pulaski, a small town about an hour southwest of Shelbyville and the Klan's birthplace. Hedy Weinberg, executive director at the ACLU's local chapter, told The Tennessean at the time that they found the views of the Klan reprehensible and against the core of what the organization stands for — but “we’re still pledged to protect the First Amendment rights of all Tennesseans." The ACLU won the lawsuit. The KKK was allowed to march. In response, the city of Pulaski shut down completely the day of the rally. When the groups arrived, there were no hotels, gas stations or shops open to feed them. The ACLU, fresh after a legal victory against the town, returned to praise its citizens' response and pass a resolution celebrating Pulaski's actions. They did not shut down free speech, says Weinberg, but instead united their citizens in peaceful defiance. 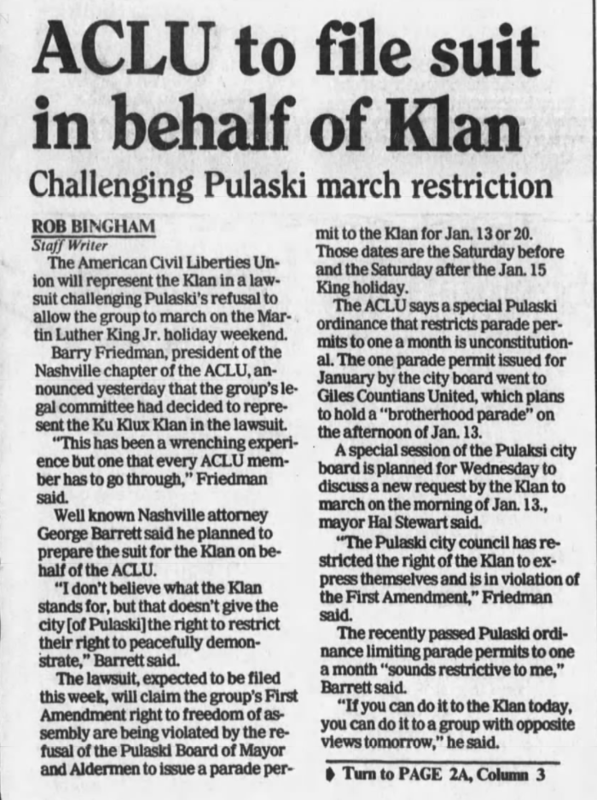 An article published in The Tennessean on January 11, 1991 announces the return of the Klan to Pulaski after the city lost the lawsuit filed by the ACLU. Weinberg, who still leads the state chapter, says their commitment to upholding the civil rights of all Americans hasn’t changed — even when defending freedom of speech clashes with the organization’s own ideals. The ACLU is also known for its civil rights advocacy, protecting the very groups that are often targeted by white nationalists. Some of the institution’s priorities include ending mass incarceration and the disproportionate arrest of people of color, LGBT rights and extending legal protection for immigrants and refugees. Though none of the white supremacist groups planning a rally in Tennessee have reached out to the ACLU this time, it's still an internal conflict the organization has to consider. "We will continue to condemn that speech and repudiate the underlying messages of the white supremacists but we have to ensure that their right to speak is not taken away," says Weinberg. "When government officials have the right to pick and choose what kind of speech they favor, our democracy is in jeopardy." It's a protection that Weinberg says extends to the counter protesters who show up to voice their disagreement. Their ability to freely voice their grievances, she says, is also possible because people have fought to protect the first amendment. For the Tennessee rally, the local ACLU chapter has partnered up with local community groups like Murfreesboro and Shelbyville Loves in support of peaceful counter demonstrations. Shelbyville Loves, a group organized by local residents and counter protestors, has been working with local business owners in preparation to the rally on October 28. 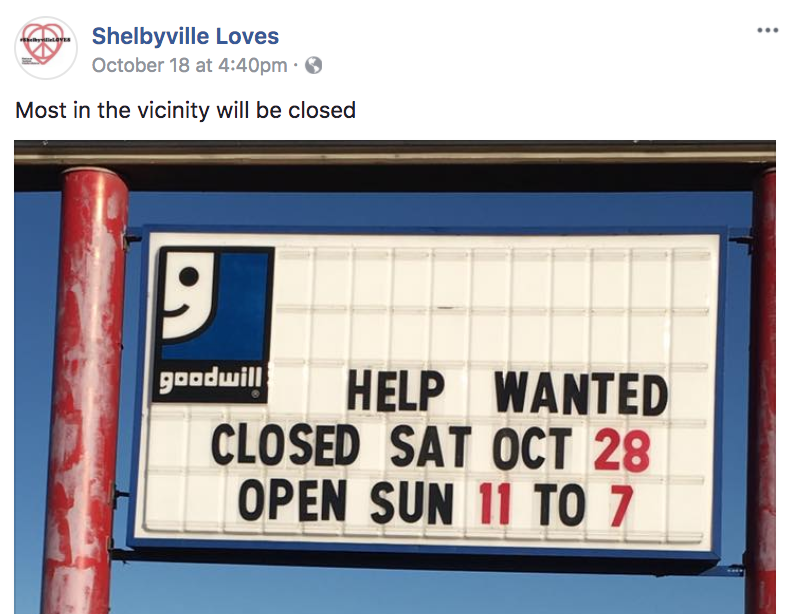 They say most businesses will close. The groups are also holding daily vigils, organizing nonviolent resistance workshops and coordinating with local business owners, who will close their shops the day of the event. The national ACLU has also changed its policy for the first time after the protests in Charlottesville. In August, after public controversy and some turmoil amongst its members, they announced they will no longer represent protesters who plan to be armed. Tennessee lawmakers are delaying until next year a proposal to define anti-Semitic speech on college campuses. 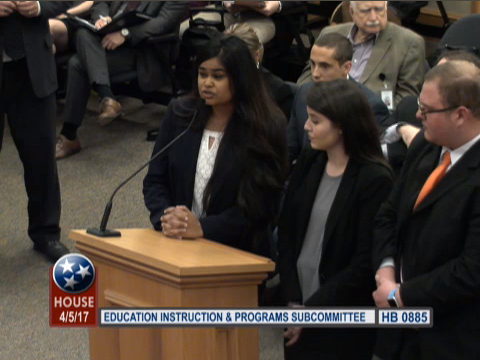 The move came after several University of Tennessee-Knoxville students testified Wednesday that hate speech is not a problem at their school. Tennessee’s new law that makes it a crime for pregnant women to use illegal narcotics is coming up for debate again. Groups that tried to block the bill last year are now aiming to keep the law from being renewed. Tennessee's unsolved civil rights crimes are getting a fresh look. 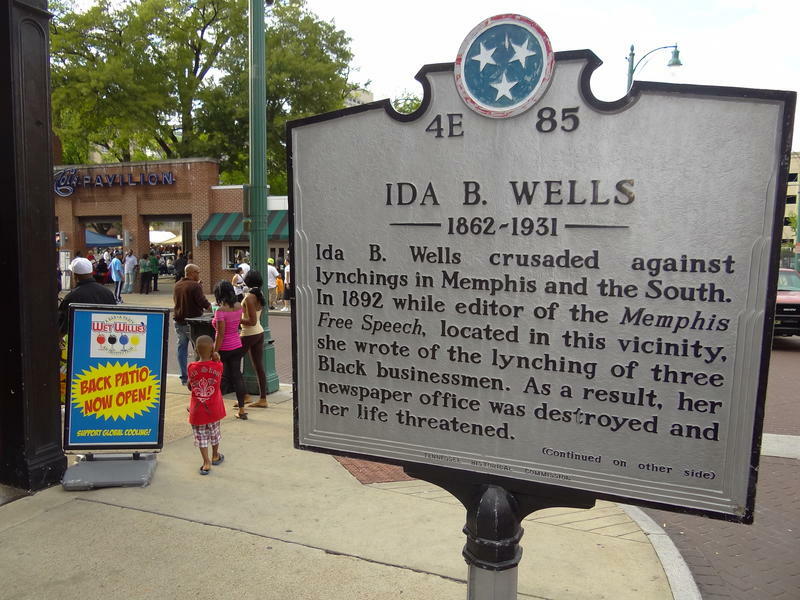 Legislators are asking lawyers to dig into the state's history of lynchings, firebombings and other racial violence perpetrated during Jim Crow and the Civil Rights Movement. Some cases may even be recommended for prosecution.